Edinburgh is Scotland's cosmopolitan capital city and located in a lush countryside and the attractive coastline of the Lothians. Here you can enjoy rich history, natural beauty and the adventures of Harry Porter. If you only have 48 hours in Edinburgh this would be recommendable walks! Enjoy a breakfast at Thomas J Walls coffee at Forrest Rd, Edinburgh EH1 2QN and head to the National Museum of Scotland after. Their collections contains treasures like art, design, interior, dinosaurs, technology of the future and much more. The exhibition will take you on a journey of discovery through the history of Scotland and around the world, taking in the wonders of nature, art, design and fashion and science and technology – all under one roof. Don't miss the look out from their terrace. 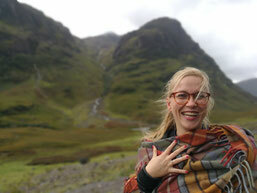 If you like to shop vintage cloth the Armstrongs Vintage store is the place to be! It's located at 81-83 Grassmarket, Edinburgh EH1 2HJ. Check their website for more infos: www.armstrongsvintage.co.uk. If you looking for a gift to bring for your love once, buy some handmade fudge at Fudge Kitchen at 30 High St, Edinburgh EH1 1TB. See also website: www.fudgekitchen.co.uk. Fudge doesn’t get more authentic than this. They still boil up each batch in a huge copper pot over an open flame. Hot fudge is then poured onto an Italian marble counter to cool, where their artisan fudgeteers skilfully turn it with huge spatulas in fabulous flourishes. The cooled ‘baguette’ of fresh fudge is then sliced into generous 175g slices, firm on the outside, soft and creamy in the centre. I also found some lovely books at The Fruitmarket Gallery in 45 Market St, Edinburgh EH1 1DF (www.fruitmarket.co.uk), afterwards you can find some original Shepherd's Pie at The Doric – Wine Bar & Bistro at 15-16 Market St, Edinburgh EH1 1DE. Delicious! In the Scottish National Portrait Gallery you come face to face with the people who shaped Scotland’s past, present and future. Scottish National Portrait Gallery, 1 Queen St, Edinburgh EH2 1JD, www.nationalgalleries.org, daily 10:00–17:00. I highly recommend the Holyrood Park. 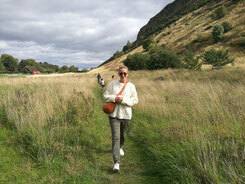 It is a "countryside" walk in Edinburgh’s heart. It is a 640 acre Royal Park adjacent to Holyrood Palace. The parks highest point is Arthurs Seat, an ancient volcano, and sits 251 m above sea level giving excellent view of the city; it is also the site of a large and well preserved fort. This is one of four hill forts dating from around 2.000 years ago. With its diverse range of flora and geology it is also site of Special Scientific Interest. We dined at the Grand Cafe at 20 North Bridge, Edinburgh EH1 1TR, where you can also find beautiful cocktails and live piano music until 3:00. Enjoy a breakfast at Broughton Delicatessen, 7 Barony St, Edinburgh EH3 6PD (www.broughton-deli.co.uk). Shop some tea at Rosevear Tea at 71 Broughton St, Edinburgh EH1 3RJ. 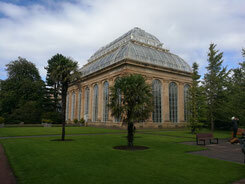 Walk through the Royal Botanic Garden Edinburgh at Arboretum Pl, Edinburgh EH3 5NZ. The It is a highlight of any visit to the Scottish Capital. A national treasure of Scotland, this spectacular Living Collection is nearly 350 years old. Set in over 70 acres of beautiful landscape and just one mile north of the city centre, the Garden offers superb panoramic views of the city skyline featuring Edinburgh Castle. Don't miss the glass houses! Besides the castle, I also loved the architectural grandeur of Edinburgh’s New Town and the Georgian House. Here you can explore the drawing room and dining room, designed to entertain and impress guests and bring history to life (by dressing up in costumes, optional ;). Edinburgh Castle is another exciting historic site in town. Set in the heart of Scotland's dynamic capital city it is sure to capture your imagination. To avoid the queue you can buy the tickets online. If you have enough of history, you can also visit the restaurant The Witchery by the Castle (not cheap) and have a beautiful diner their. If you never ate Indian food Mother India's Cafe is the best Indian restaurant in town and is more affordable! Close by you can find The Jazz Bar with live music every day.